Jedediah Hotchkiss is justly famous as "Stonewall" Jackson's principal mapmaker. But almost no one has ever heard of Oscar Hinrichs That's all changed now, thanks to the historical sleuthing of Richard B. Williams. Historians, archivists, and researchers all dream of stumbling across a relatively obscure, previously unpublished, primary source that offers new perspectives on important people and events. 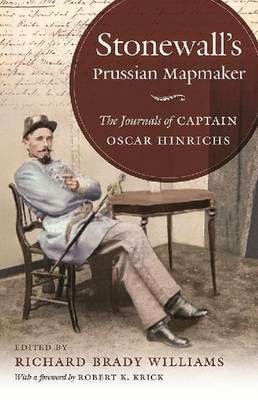 Williams' eureka moment came in 2000 when a Civil War memorabilia dealer tipped him off to the existence of the unpublished diaries of Captain Oscar Hinrichs, a Prussian born engineer officer who served the Confederacy with distinction throughout the war. An experienced researcher and manuscript editor, Williams developed a plan-of-action to verify the journal and validate its content. It proved to be a long and complicated process but Williams and a host of dedicated helpers stuck to their guns. The end-product is a treasure trove of detailed observation and candid insight that Robert Krik's forward rightly characterizes as "an enormously important primary source." Williams worked with Hinrichs' wartime memories in two forms; a wartime transcript covering November 1860 to September 1863 and a verbatim English journal and translation of his German journal spanning September 1863 to April 1865. From this material, Williams has brought to life an opinionated man of considerable intelligence, excellent education, discerning insight, and a not inconsiderable amount of wit. Hinrichs was an infant when his parents brought him to New York from Germany. His comfortable childhood was interrupted by the death of his mother when he was only four. His loving North Carolina-born stepmother, however, immersed him in the culture of her successful Southern family and his frequent visits probably sowed the seeds of the divided loyalties he experienced later in life. Classically educated in Europe, Hinrichs returned to the United States in 1853 as a confident, idealistic, and ambitious young man steeped in the skills needed for a career as an engineer. Williams' illuminating introduction concludes that "the close relationship Oscar had with his stepmother influenced his decision to join the Confederacy." 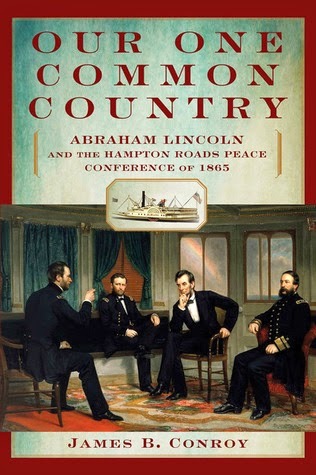 In a postwar essay not included in the monograph, Hinrich wrote "My sympathies were with the people of the South, among whom I had lived so long, and where I had many warm friends." He joined the U.S. Costal Survey in December 1856 and his first assignment was to map the coast from Virginia to Georgia would be the first of many professional Southern sojourns. When the war broke out, however, he found himself surveying the coast of Maine. His clandestine journey south to join the Confederacy had enough nocturnal rendezvous, narrow escapes, and secret signs and safe houses to fill a Hollywood screenplay. Shadowed by a government detective after he left New York, Hinrichs and a few colleagues headed to Baltimore. With the help of Confederate sympathizers in southern Maryland, they crossed the Potomac River in a skiff on New Year's Eve and entered the camp of Colonel Wade Hampton on the first day of 1862. John Wilkes Booth would follow nearly the same route in 1865. Hampton quickly sent Hinrichs on to General Joseph Johnston's army camped near Centerville, Virginia. Hinrichs' makes the purpose of his journals clear from the beginning. He describes them "as notes public and private of my own personal feelings and experiences during the war" which include "my opinion at the time of measures and affairs as they occurred to me." In the future, Hinrichs hopes "they may become useful references and also records which have mostly been verified by subsequent events." After early duty in Tidewater Virginia, Hinrichs was ordered to join Jackson in the Shenandoah Valley in May 1862, just in time for the battles of Cross Keys and Port Republic. He would remain with Jackson's vaunted Second Corps throughout the war. With a true engineer's eye for topographical detail, Hinrichs brought the same skill to his observations of men and events. From his transcript, Hinrichs opines that the Gettysburg campaign failed "first in not getting possession when it was practicable of the ground commanding the Baltimore pike and the hill contested by [Edward] Johnson. Second the want of unity of action on the part of the attacking columns; third, the not supporting of those columns which had effected lodgments in the enemy's lines in a manner adequate to the occasion." He was equally as candid when assessing the qualities of his fellow officers. Hinrichs believed General D.H. Hill "uncouth and ungentlemanly in his manner" with "a mind narrow and shallow, he possesses no genius for command." Jackson, on the other hand, was "In person, quiet, modest, diffident and unassuming, [Jackson] bears upon him his honors lightly and meekly." Hinrichs observed Jackson on battlefields from Malvern Hill to Chancellorsville and found him "Brave to insensibility, insensible to rashness and obstinacy, he stands firm and cool among a shower of shot and shell which makes him stand aghast at the apparent tempting of God's mercy and kindness." A man with a facility for the English language like that deserves to be published. Williams has done an excellent job of annotating Hinrichs' journals and provides insightful footnotes. Appropriately, more than a dozen maps, drawn by George Skoch, help give geographical context to Hinrichs' rich narrative. This journal should rank among the best contemporary surveys of the war in the East from the Confederate point-of-view.